“Sanremo Rims” is our own brand and is characterized by a very good price and performance ratio. Almost all rim dimensions are immediately available and there is a rich abundance of it. These lightweight Sanremo rims are processed very clean and are almost for all purposes. The italian manufacturer brings decades of experience in this production and supplies most renowned OEMs such as BMW, Aprilia, Husqvarna, and so on. 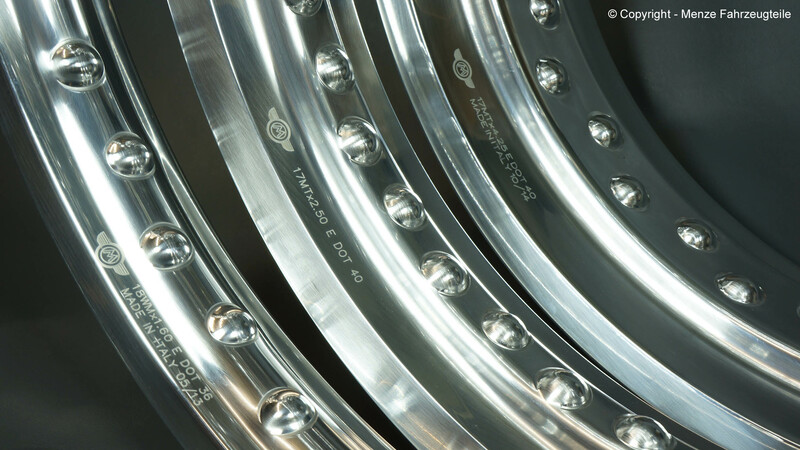 These rims are coming in a polished condition. Please remember, bare aluminium must be protected and cared for.Depending on the rim size, the profile section of the Sanremo rims is changing. The rounded profile can be found only at the narrow rims, starting at 1.60” width to 2.15”. From 2.50” the rounded profile is detached from the cornered one. The visual effect which is caused by the density of the hallmarking, is then only influenced by the number of holes and the rim width.